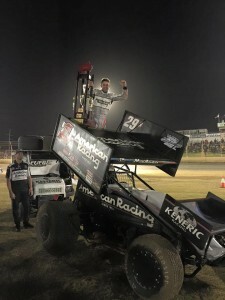 Kerry Madsen “Booommm , A 1, what an honor “ | Talking Speedway, Speedway news from around the world! Kerry Madsen showed the wealth of Outlaw experience gained over the years he and his Keneric Team have pounded the Outlaw tour across the US . This was the edge he needed to win his second Australian Sprintcar Championship. 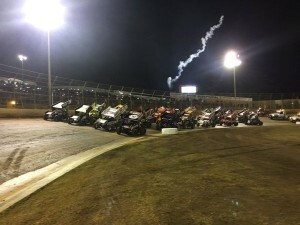 The two days of qualifying around the Premier Speedway high banks suggested the race would be between Madsen, Tatnell, Veal and defending Champion Dave Murcott. 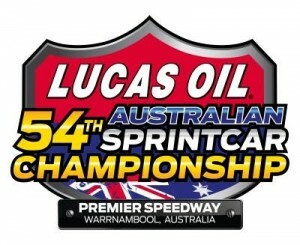 Another massive crowd surged into the speedway to watch Australia’s best challenge for that A1 Plate. With overseas entries prohibit this is truly a race of Australia’s best, no Americans required. Tatnell did everything thing possible in trying to record his 6th Title .Winning his qualifying Feature on the first night over Kerry Madsen and then setting up his pole start by beating Madsen again in the A Dash. Before the start S19 Keller pulled infield which allowed former 6 times champ Garry Brazier his opportunity to join the pack as first reserve.The start of the Championship decider got off to a predictable start, with adrenalin pumping right through their bodies and down to the right foot the start was undone when Robbie Farr NQ7 spun with Lines, Lacey ending up alongside .Before the race had completed the opening lap V40 Belliman,W12 Harding and V70 Vogel joined Keller on the infield . “Brooke set a quick early pace so I knew it was going to be a battle,” Madsen said. 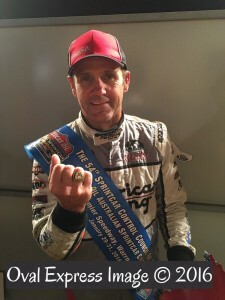 “The car stayed consistent and it is great to win for everyone who has put so much work in.” Later in a tweet Madsen posted “Booommm , A 1, what an honor “and that said it all. Let’s hope that they put the A1 on the car for the Outlaw season as this would be a fantastic image for Sprintcar fans and his team sponsors in Australia and US as they follow his 2106 season. So let’s wrap the Keneric Racing /American Racing Custom Wheels with AUSTRALIA 1. A second Title for the boy from St Marys NSW and this time the Championship ring, not available back in 203 when he won his maiden Australian Title. This entry was posted in General Speedway News by admin. Bookmark the permalink.